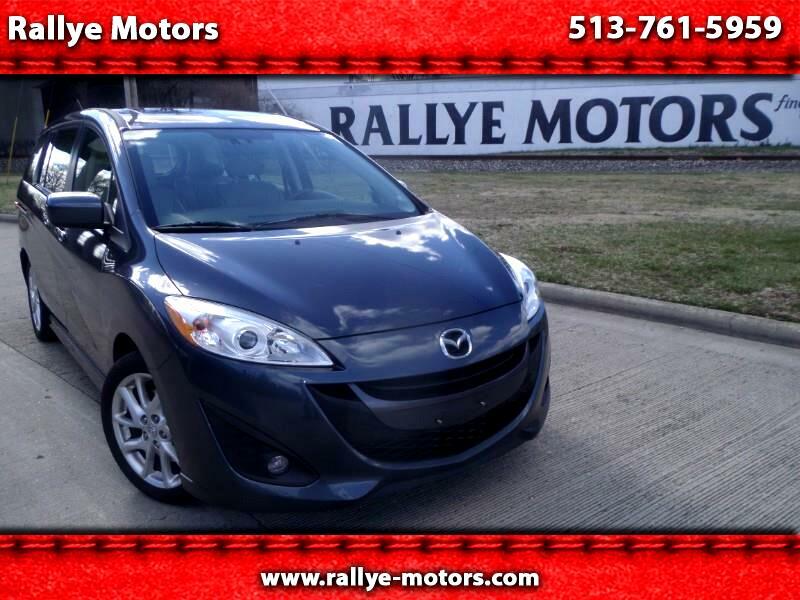 2012 Mazda 5 Grand Touring mini (micro?)van. The top of the line model that looks and drives beautifully. You can spoil yourself on a budget. AutoCheck History says one accident with damage to rear. Close examination shows nothing more than cosmetic repair- I wouldn't know if it didn't say so- and you are welcome to have it inspected pre-purchase. This has six bucket seats and the rear four fold flat to make a roomy hauler to visit the Burlington Antique Fair when spring comes. So a family van that drives and parks like a sedan, which it actually is underneath. It is in reality a boxy Mazda 6, a proven safe and dependable car. 2.5 liter 4 cylinder, front wheel drive, 5 speed automatic with sport manual shift mode, filtered automatic climate control with rear air and heat, Bluetooth hands-free phone, power moonroof, leather seating (heated in front), power windows/locks/mirrors. tilt and telescopic steering wheel with controls for audio/ Bluetooth phone/ cruise control,17-inch alloy wheels, ABS, Traction Control, Stability Control, front/side/head airbags, remote keyless entry, security alarm, Bose audio AM/FM/ 6-Disc CD Changer with aux. jacks, leather interior, multi-adjust driver seat, sliding rear doors, height adjusting Xenon headlights, auto lighting, auto-dim rear view mirror with garage door openers, all weather mat set, folding tray table, heated outside mirrors, rear spoiler, rear wiper/defroster, more. Good car that is easy at the pump, safe and dependable. Check our website for another one that is a Sport with less miles and lower price- www.rallye-motors.com.